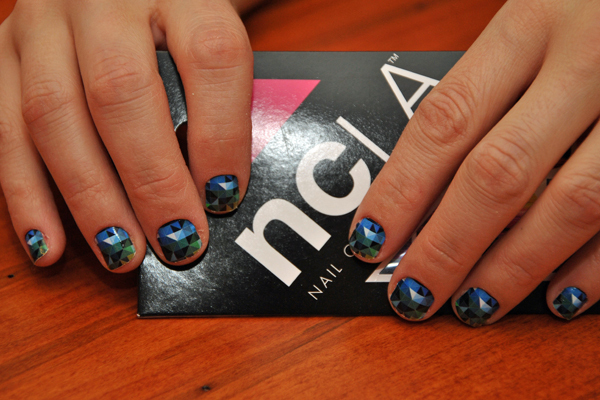 I'm not sure which magazine's twitter feed it was that I learned about NCLA nails from but Thank You to whom ever it was! The instant I popped over to their page (HERE) my mouth dropped and I instantly craved. 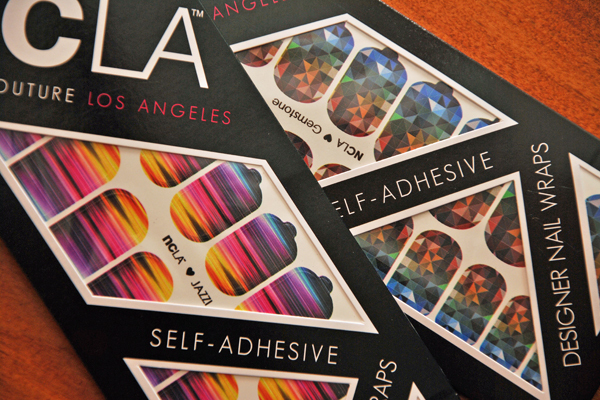 I'm a fan of the Sally Hansen nail strips but everyone is wearing them and they get boring after a while. I was looking for something new, different, and fun and NCLA offered just that. I had a hard time choosing which one to get so I settled on the Gemstone and the Jazzi. I knew I wanted to wear the Gemstone to the LOFT and Marie Claire fashion show but was a little disappointed when I first applied the nails. The green color I was going for got filed off since my nails were short. The resolution-I flipped them upside down and cut off the little tabs. Problem solve and I'm now in love. The difference with this brand is that you apply a clear coat of polish underneath the foil before apply and then a clear coat on top. I actually always applied a clear coat on top of the Sally Hansens but never underneath. I actually like doing that because it protects you natural nail from the sticker when removing. The other nice thing is that they give you 40 nails-2 full sheets! It's enough to do your nails twice which makes up for the bigger price tag ($16). So what do you think?? Are you in love as much as I am? I bought the Jazzi to try as well...but I'm thinking of doing a giveaway with them? Would anyone be interested? Must go get ready for the fashion show! I do have to say that NCLA did not sponsor this post. I bought these on my own to try out. omg yes please! 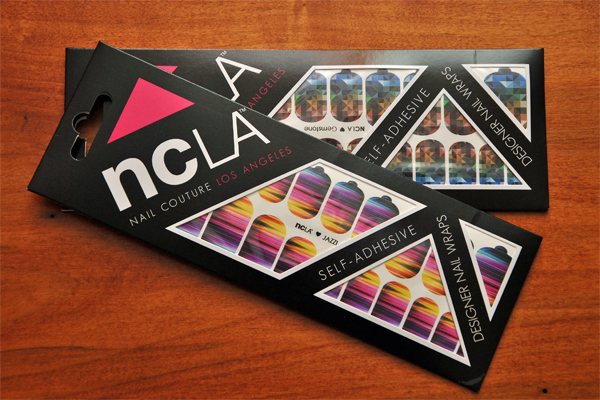 love ncla! !